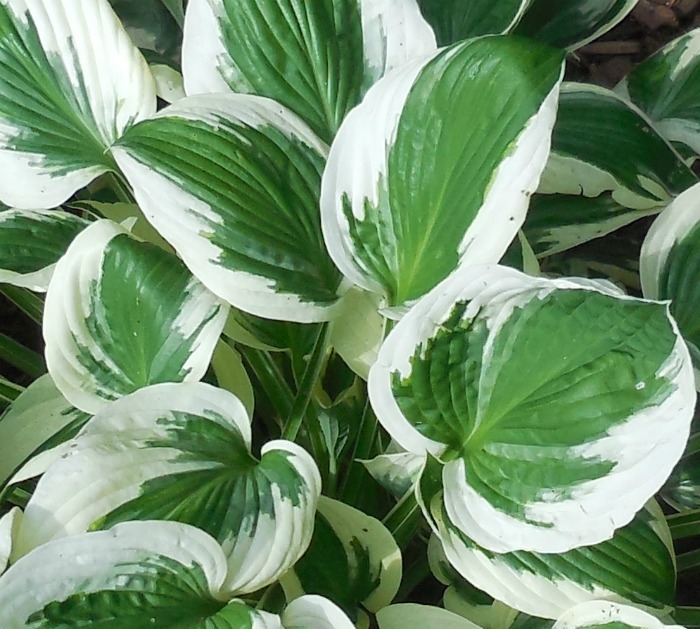 Hosta Minuteman is a delight in a shade garden with it’s deep white margins. It makes a great container plant and will stand out against other plain green hostas in any shady garden spot. This plant is one of the few hostas that don’t mind more sun as long as you take care to keep it well watered. 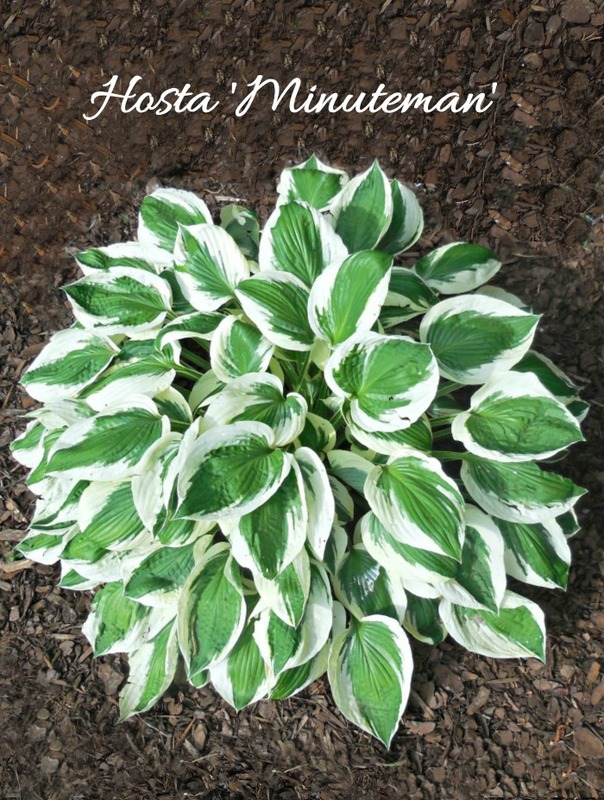 If you are looking for a star of the shade garden, Hosta Minuteman is the perfect plant. It has gleaming white leaf edges against a dark green center that makes it a standout in the garden. Hostas are some of the most popular perennials for shady garden beds and there are hundreds of varieties now available. I like to add a new hosta to my collection each year and am always looking for new types. Give this plant a semi shady spot in well draining soil and then be amazed all summer long at the fabulous leaf color that this hosta brings to your garden. Here are some general growing tips for Minuteman Hosta. The plant prefers part Shade to Full Shade but is a Hosta type that will tolerate more sun if you give it plenty of moisture. 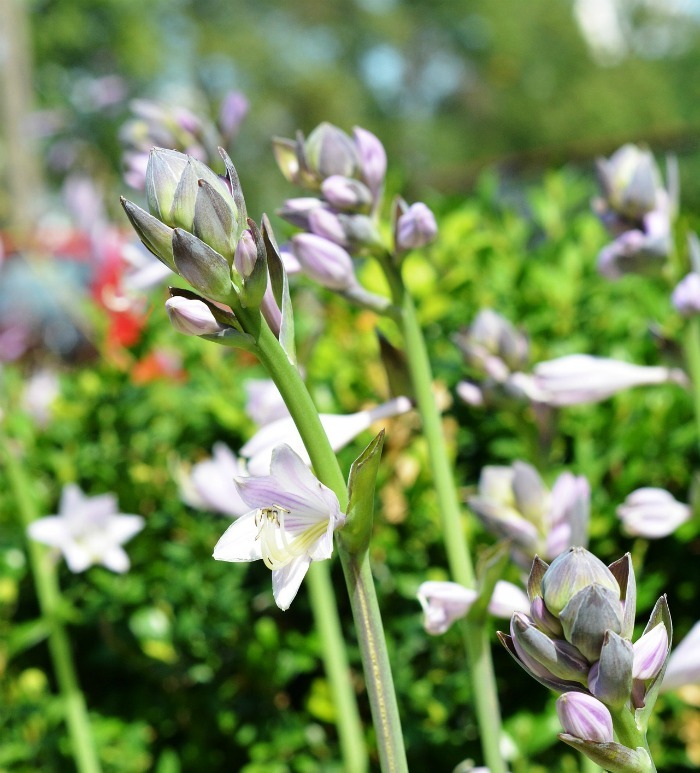 Like most hostas, Hosta Minuteman is has lily like bell shaped flowers that sit atop long stems. The flowers appear in mid summer. They are a light purple color and can be used for cut flowers. This perennial is not meant for tight spaces. You will need to give Hosta Minuteman room to grow. The plant is a vigorous grower but will take a few years to reach its full size. MInuteman will grow to 10-18″ tall and up to 36″ wide. The plant blooms in early to mid Summer and the bell shaped flowers are a favorite of hummingbirds. The leaves of Hosta Minuteman are very showy, especially when planted near other plain green hostas. They are spade shaped with a pointed tip and cupped edges. The margins are very white with dark green leaf shaped centers. 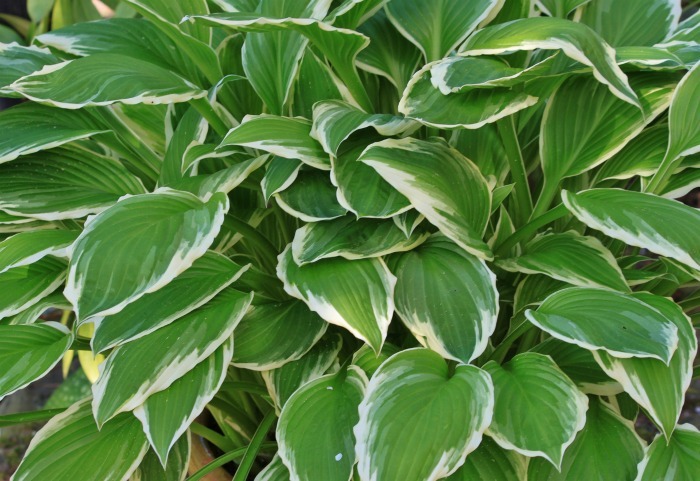 The foliage is very similar to Hosta Patriot, but with whiter margins and darker centers. Plant this perennial in fall or early spring. Minuteman prefers well draining soil, but will tolerate many soil types from clay to loamy. Adding compost to the soil is very beneficial for its growth. Hosta Minute man is an ideal shade garden plant. The flowers attract hummingbirds, and it is rabbit resistant. The long stemmed flowers are useful as cut flowers for vases and it makes a wonderful container plant for a shady spot on your patio or front entry. The plant is somewhat slug resistant as compared to other hostas. Get more plants for free by dividing a large hosta. The plant multiplies and naturalizes easily and will soon take over a spot in your garden. Keep this in check by dividing the plant, making sure that each clump has a good root system. Division can be done in spring or fall. Hostas are very popular perennials. They are very versatile and their foliage really stands out in a shade garden. Give Hosta Minuteman the right light and water it when the weather is really hot. You’ll be rewarded with years of beauty from this stunning plant. this is my first time planting, Hosta minuteman The color is what caught m attention. GROWS. I THOUGHT THIS MIGHT BE MY MATCH, WISH ME LUCK. Hope it grows well for you! Hi Sharon. Yes, it can be grown indoors. Typically hostas are grown outside in the shade, but if you choose a large pot and give the plant indirect sunlight (no direct sunny windows) it should grow just fine.